President Donald Trump has called for unity are bombs were sent to prominent figures in America. The targets for the devices included Barack Obama, Bill and Hillary Clinton and the New York headquarters of the CNN news network. Mr Trump's comments are markedly different from his previously inflammatory remarks about opponents, who has has described as criminals and argued that they will destroy the country if they win control of Congress. The president highlighted the unusually subdued tone of his remarks. A major FBI investigation is underway after the wave of mail bombs packed with shards of glass were sent to leading liberal figures across America. At least eight devices, described as crude but "viable", were intercepted before reaching their targets. Investigators will be working to glean forensic clues to help identify who sent them, gathering fingerprints and DNA evidence while tracking the origin of the packages and the components used to make the bombs. Larry Johnson, a former head of criminal investigations for the US Secret Service who also served as a special agent in charge of the presidential protective detail, said that bomb makers usually leave evidence behind. Johnson said it is highly likely that the person or people who built the bombs have been previously flagged by law enforcement. The FBI said all of the packages contained a return address of "DEBBIE WASSERMAN SHULTZ" (sic), the Florida congresswoman, an apparent reference to her role as former chair of the Democratic National Committee. 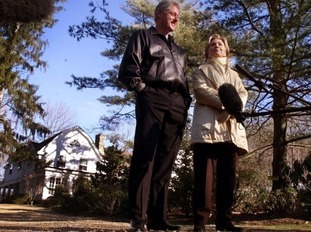 An official in the US said a "functional explosive device" was found at the Clinton's home in Chappaqua in the early hours of Wednesday. The packages to the Obamas and Clintons were all identified during postal screening and intercepted by the US Secret Service. One of the pipe bombs intercepted by police. US news network CNN was also forced to evacuate its offices in New York following the discovery of a pipe bomb in a suspicious package. While the programme was on air and the presenters were discussing the other suspicious packages an evacuation alarm was sounded. Bomb squads were seen posted outside of CNN's office, which is based in the Time Warner Center. Later, FBI officials confirmed that a suspicious package had also been sent to Democrat congresswoman Debbie Wasserman Schultz. The suspected bombs are believed to be linked to one found on Monday at the compound of billionaire George Soros. In a joint statement, the authorities said: "The packages were immediately identified during routine mail screening procedures as potential explosive devices and were appropriately handled as such. The FBI said five packages are now being analysed at its lab in Virginia. Mrs Clinton had been at a Florida fundraiser at the time, and afterwards commented that "we are fine". She thanked the Secret Service for intercepting the explosive "long before it made its way to our home." The former presidential candidate said that her family was grateful for the Secret Service's "service and commitment and obviously never more than today." Ms Wasserman Schultz says she will "not be intimidated by this attempted act of violence," after two of her Florida offices were evacuated. She continued: "This appalling attack on our democracy must be vigorously prosecuted." Ms Wasserman Schultz added she is "deeply disturbed by the way my name was used" in the attack, but will continue her work in Congress. New York City's police commissioner said that the package sent to CNN's offices contained what appeared to be a live explosive and an envelope containing white powder. Police described the acts as "clearly an act of terror". "We have seen this before. We have seen worse and we will not be intimidated and we will bring these perpetrators to justice," the commissioner said. No arrests have so far been made. The White House quickly condemned the "despicable" acts. Speaking earlier on Wednesday, Trump - who in the past has repeatedly attacked both the Democrats and the media said "we have to unify, we have to come together". He added that "acts or threats of political violence have no place in the United States". Mr Trump said a "major federal investigation" has been launched, adding: , "We're extremely angry, upset, unhappy about what we witnessed this morning and we will get to the bottom of it." The US President also tweeted he "wholeheartedly" agreed with vice president Mike Pence's criticism of the acts. "These cowardly actions are despicable & have no place in this Country," Pence tweeted. First lady Melania Trump also condemned "all forms of threats and violence". White House spokeswoman Sarah Huckabee Sanders said: "These terrorizing acts are despicable, and anyone responsible will be held accountable to the fullest extent of the law.